Spots are daring, flashy, and appealing. Spotted agate stones in vibrant hues from green, red, and orange make a beautiful pattern with black rhinestone pave beads. What you’ll love: the bright colors are the perfect add for any look. Brighten up a little black dress. Accompany a bold printed blouse. Contrast a solid colored t-shirt. This bracelet makes for multiple way to wear. 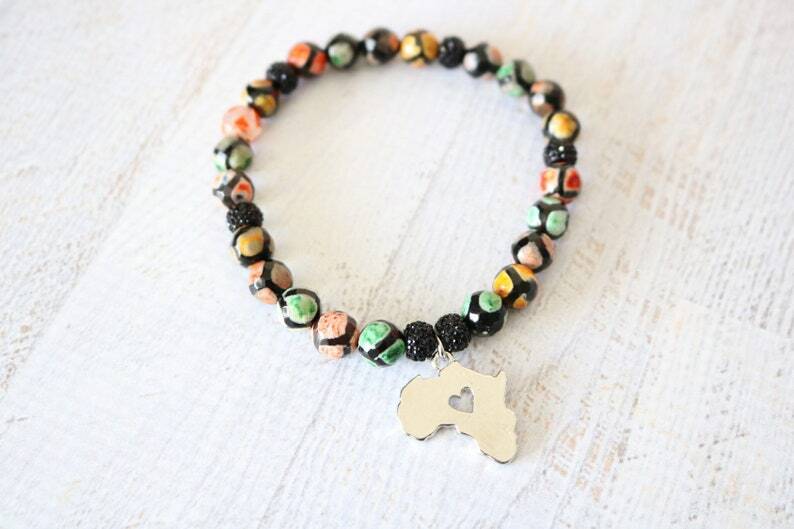 Show a your pride with a silver tone charm with a heart-punched cutout of Africa.